Today marks International Women’s Day so it’s appropriate we take a look at the contribution made by women to the insurance industry. The Insurance Information Institute (I.I.I.) reports that women have comprised about 61 percent of the insurance industry workforce in each year from 2006 to 2015, according to the Current Population Survey (CPS), an annual survey of business establishments in private industry conducted by the Bureau of Labor Statistics (BLS). In 2015, there were 1.6 million women employed in the insurance sector, accounting for 59.4 percent of the 2.7 million workers in the insurance industry, according to the BLS. 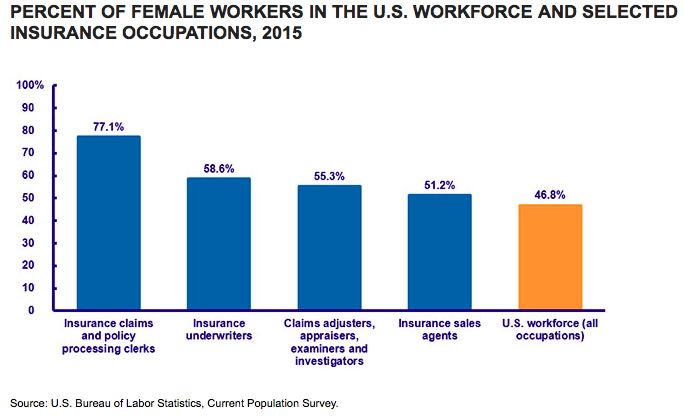 The percentage of women in selected insurance occupations varies, ranging from 51 percent of insurance sales agents to 77 percent of insurance claims and policy clerks in 2015. In 2015, women accounted for 47 percent of all workers, based on households in the CPS survey. An ever-increasing percentage of small businesses in the United States are owned by women. In recognition of Women’s History Month, the I.I.I. recommends six key strategies to ensure your business is financially protected. Also check out the I.I.I’s Pinterest Board that looks at the great strides women have made in the insurance field, including profiles of some of the most influential insurance doyens today. The Insurance Industry Charitable Foundation (IICF) today announced the fourth year of its Women in Insurance Conference Series. The IICF Women in Insurance Conference Series is designed to provide an environment for insightful discussions surrounding gender diversity in insurance, industry leadership, and the changing world and future of the insurance industry. Primary sponsors of this year’s conference series include CNA, XL Catlin, The Hartford, FM Global, WillisTowersWatson, GenRe, Farmers Insurance, and Munich Re.